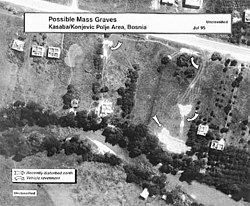 ^ Massacre Near Srebrenica was Staged by French and Muslim Agents. [2009-08-01]. （原始内容存档于2010-03-22）. ^ Separation of boys, ICTY Potocari. Icty.org. 26 July 2000 [26 May 2011]. ^ Separation,ICTY Sandici. Icty.org. [26 May 2011]. ^ Separation,ICTY. Icty.org. 11 July 1995 [26 May 2011]. ^ 12.0 12.1 ICTY, vs. Kristic, Judgement[永久失效連結]. ^ Writ of summons (4 June 2007), the Dutch law firm Van Diepen Van der Kroef Advocaten 互联网档案馆的存檔，存档日期2012年7月2日，. page 107-108. ^ Writ of summons (4 June 2007), the Dutch law firm Van Diepen Van der Kroef Advocaten 互联网档案馆的存檔，存档日期2012年7月2日，., page 101.